Kindle 2, Kindle 3, Kindle Fire, Kindle Fire HD, Kindle Fire HD 8.9"
Cozy Fire is a seamless, protective Cozy to pamper your Kindle. It is knit like a toe-up sock on a magic loop, so you can try it on as you go. It has a simple flame lace pattern and a one-button closure. 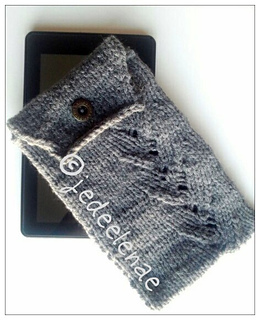 It is a quick knit and a perfect companion to your Kindle Fire, Kindle 2, Kindle 3 and now Kindle Fire HD and Kindle Fire HD 8.9”! 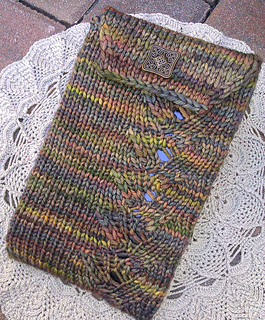 Also, check out Cozy Pad that is a sister pattern for all iPad sizes! Get handy links to technique tutorials and other nifty ideas on my blog at Useful Goodies for Knitting Your Cozy Fire. You can find this pattern on the Knit Picks website, too! Cozy Fire.